This stunning designer beach house features high cathedral ceilings that allow the warm tropical breezes to infiltrate the entire property. 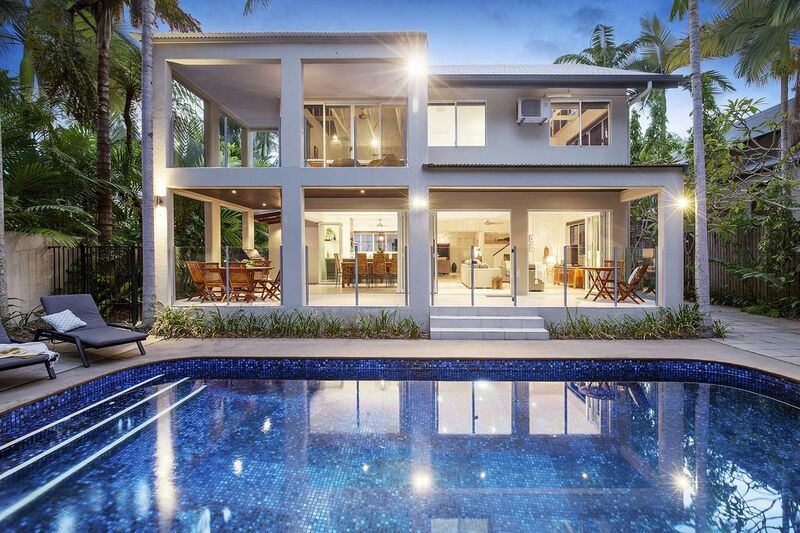 Built and decorated in a contemporary style and designed to compliment the tropical lifestyle. There are full length folding doors to create seamless transitions between indoor and tropical outdoor spaces. The pool is perfect for laps or lounging and is heated during the winter months. Beyond the pool is your own private beach pathway leads through the foreshore and on to Four Mile Beach. Tiled floors and timber finishes throughout the living areas blend harmoniously with the modern European stainless steel appliances and CaesarStone benches in the sleek kitchen. Enjoy al-fresco dining on the veranda overlooking the swimming pool. Barbeque with ease on a quality stainless steel Beefeater BBQ. Alternatively dine inside at a ten seat dining table with a servery to the state-of-the-art kitchen. Climb the stairs to the airy Master bedroom suite complete with a spacious en-suite bathroom, walk-in dressing room and a private balcony with a tropical foreshore outlook. A small bedroom with two single beds completes the sleeping configuration on the upper level. Downstairs are another three bedrooms; a queen room and 2 twin single rooms - either can convert to king beds. All rooms feature built-in mirrored robes and media desks. The downstairs area features two relaxing living areas both with TV/DVD facilities. The larger area includes a large plasma TV, DVD, Stereo system and a WiFi internet connection.